4.69 points at 13 votes (rank 792). Gouken was once a pupil of the mighty Goutetsu, where he learned the martial arts of Ansatsuken. This was especially developed for elite assassins and combines karate, judo and Kenpō. Years later, Gouken himself teaches now the Japanese Ryu and the American Sunny Boy Ken. He educated the two dissimilar characters thoroughly in the art of unarmed fight until it comes to a worldwide competition of the best street fighters. The so-called king of street fighters, a Thai kick boxer named Sagat, challenges the most talented fighters from all countries to compete in the tournament. 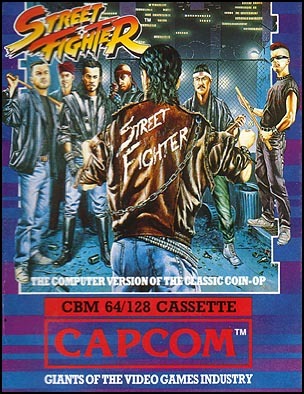 In the role of Ryu or Ken you need to defeat ten opponentes from five different countries and dethrone Sagat from the Throne of the Street Fighters. 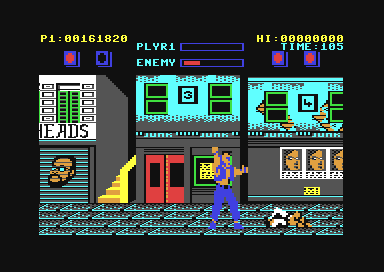 The game was released in two different versions, which could partially be bought together on one disk or cassette. Each side of the medium contained one version. This article is about the so-called European version, the other is named the US Version. In this version, the special attacks by Ruy and Ken were deleted, there are no Hadouken, Shouryuken or Tatsumakisenpuukiaku. The background scroll known from the original and the bonus level were adopted. There are loading times between the single stages. Ryu Japan Ansatsuken A disciplined martial arts pupil who aspires towards perfection and inner balance. 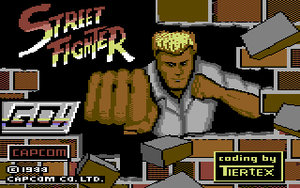 Ken USA Ansatsuken Talented but less disciplined, Ken is equally friend and rival for Ryu. Retsu Japan Karate The Japanese Karateka enters the tournament with home advantage in his own Dojo. Geki Japan Ninjutsu With age-old ninja techniques can Geki teleport over short distances. His Shuriken are bothersome. Joe USA Kickboxing Joe is an experienced roady and backyard wrestler from New York. 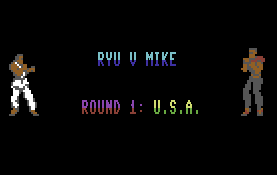 Mike USA Boxing The former professional boxer was excluded from his association and now makes his money as a Street Fighter. Birdie England Freestyle The Londoner Punk is over 2 meters high and really strong. Sometimes he works as a bouncer. Eagle England Escrima Eagle has learned the Philippine stick fighting to perfection and enters the tournament with a weapon. Lee China Kung-Fu This master of the Shaolin-Kung-Fu wants to worthy represent his home canton China in the competition. 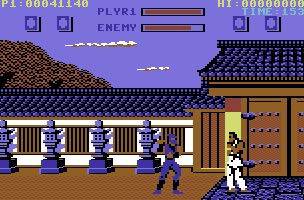 Gen China Kung-Fu Gen is an older, perfidious Kung-Fu fighter for which victory is what counts. Adon Thailand Muay Thai The dreaded tournament fighter is fast as lightning and hits hard as iron. To successfully pass the breaking you need to press the fire button and let it go, when the bar is as far to the right as possible (max). 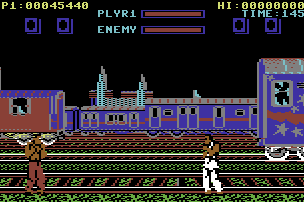 In the two-player mode, player 1 competes with Ryu against player 2 with Ken. The one who wins 2 fighting rounds first, then starts the tournament in the one-player mode. 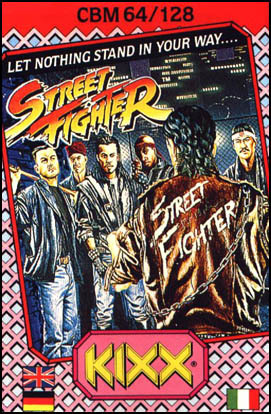 This way also Ken can get King of the Street Fighters. Street Fighter fans call this "Change History Mode". For the first opponents (incl. Birdie) it is usually enough to pull the joystick diagonally into the opponent's direction and then press the fire button in quick succession to win. There are no cheats known. 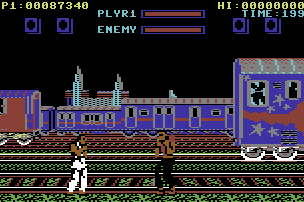 Some of the cracked versions of the game have trainer functions. Shmendric: "Oh dear, one has really troubles to find something positive... Okay, let's say, the sound is just within the range of bearable. 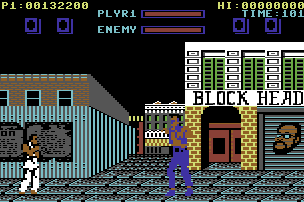 But this is the best that I can say about this totally botched version of an in the original rather good and challenging beat'em up. That they wanted money at all for such a amateurish rubbish, is almost an impudence." 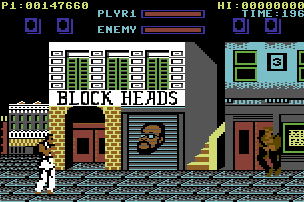 TheRyk: "The term Stretch-Sprite was taken very literally here, some enemies are tall enough to drink from roof gutters. But this is not really what makes the game a bad one. 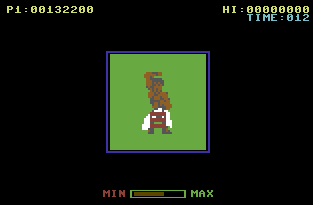 Lack of contrast or even same color of background colors and sprites are really annoying, though, and makes you wish for an improved version because no one wants to hack the sprite colors before each and every battle. Controls are just terrible. Only routine, luck or patience enable you to perform a combo of hits and thus, winning a fight. Gamers who manage to play through this poor game without trainers don't deserve respect but rather sympathy. All in all, the Go! 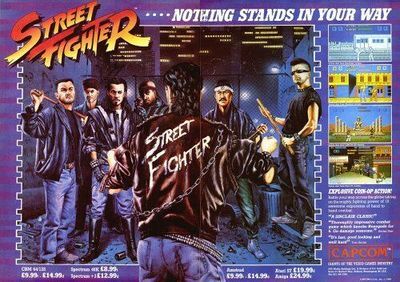 Version of Street Fighter is a truely poor beat em up worth 3 points including bonus for the music which might not belong to everyone's top 100 but is a classic among SID gourmets." This page was last modified on 15 December 2014, at 23:43.